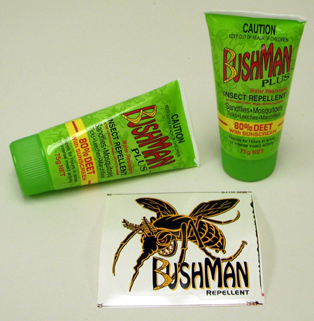 The BushMan Plus water resistant insect repellent with sunscreen (hereafter referred to as BushMan or repellent) comes in a plastic squeeze tube that is roughly 1.75 in (4.45 cm) in diameter and is 4.75 in (12.1 cm) long. The tube is bright green in color with red lettering and a green plastic cap. The front label claims that it repels "sandflies, mosquitoes, ticks, leeches (a new one for me) and marchflies". It uses DEET (Deithlytoluamide) as its main ingredient and contains 80% of it. The front label has the manufacture's claim that it, "Repels for hours in areas of intense insect activity". It does not have any indication of the Sun Protection Factor (SPF) rating that I am used to seeing on US products. In fact at the very top of the tube it says, "CAUTION keep out of the reach of children". Now they either want to make sure that kids do not use it, or they are appealing to the "ooh, ooh, this is the manly stuff that I must have." While it says that it contains 80% DEET there are no other ingredients listed. The consistency is a little thicker than the oily 100% Deet I have written about here at backpackgeartest.org, but not as thick and creamy as other lower concentration Deet-based repellents I have used. It is almost clear, with just a slight milkiness. I used the BushMan Plus on a desert day-hike on the Pacific Crest Trail in southern California and a backpacking trip in the San Jacinto Wilderness. I also used it on a day-hike in Minnesota. The temperatures ranged from 50 F to 90 F ( to C) in weather that was clear and sunny for the most part. Elevations ran from 4000 to 9200 ft (1200 to 2800 m) with more bugs found at the lower levels and more UV at the higher levels. I have used DEET based repellents for many years and have never had any problem with them due to high concentrations. I know that some of my friends have skin issues with it, but I am lucky in being able to use anything. But I do not care for the oily feel or weird odor of the 100% versions. The BushMan repellent with sunscreen does not smell bad. It smells like hand soap with a sharp bite to me. It does not leave an oily finish as long as my 100% DEET products either. It does feel oily at first, but soaks into my skin and dries fairly fast. It is very water resistant. In fact it is hard to get off in my experience. Even after washing with soap after I get home I can still smell it on my skin. It is sweat-proof too. As much of the use in California was in desert conditions I was sweating quite hard shortly after starting the hikes. The BushMan Plus stayed put quite well and kept on protecting from bugs, and I will assume from the effects of the sun too. While in Minnesota the main bug related problem is extremely aggressive mosquitoes that fly around in clouds in the field. The BushMan Plus worked very well to deter them. In California I deal with mosquitoes also (though fewer in number), plus ticks, gnats, and deer flies. Again the BushMan Plus handled them all with aplomb. I never received a single bite to any area that I had applied the BushMan Plus. Until I married Jenn I never used sunblock on normal backpacking trips, only mountaineering trips. As she wants me to stick around for a while, and not look like leather face, she has got me protecting my skin a bit more. So using the BushMan Plus with its sun blocking abilities allowed me to kill two birds with one stone. Since it does not have an SPF factor I am not sure what level of protection or duration it is supposed to provide. But I think that the product works well. I really do not have much of a way to tell other than to say that I never got sun burned on the three trips I used the BushMan Plus. As I tan well and am outside a lot, it is only when I burn that I know I got too much sun. On one 20+ mi (32+ km) hike in exposed desert conditions I applied the BushMan shortly after starting for bugs, then after walking in the sun for the next nine hours I saw no signs of sun burn. And as I did not peel a couple days later (my normal sign that I over-did the sun exposure) I have to say it works. Unfortunately I had to stop using the BushMan Plus after three trips as I realized that the allergy conditions that I was experiencing were being caused by the product, not the dust and flora as I first thought. I have used the company's regular BushMan repellent with no problem what so ever. But the sunblock version makes my eyes water and sinuses run within minutes of applying it. At first I wrote it off to my normal flower pollen and dust allergies until I applied it at home once before leaving on a day-hike. The reaction started before I could even get in my car to leave, making me realize that the BushMan Plus was my problem. It does not bother my wife, so I gave her the two tubes that I had. While I can not use the BushMan Plus I can't fault the product. It does what it says it will do, block sun and repel insects. I wish I knew what the ingredient it contains that I am allergic to. If they ever change the formulation I will be happy to try it again, but for now I will use their regular repellent and use a stand-alone sun block.